Yes, your requests have been heard and answered, so subscribe today and get your fix. I am very pleased to announce that you can now subscribe to The Kwaj Blog. A lot of feedback and questions have come in from Kwaj Net Facebook and the Contact Form, regarding the ability to not only subscribe to the blog, but to also get notifications of comments. The latter was always possible – you just need to be logged into to do so. 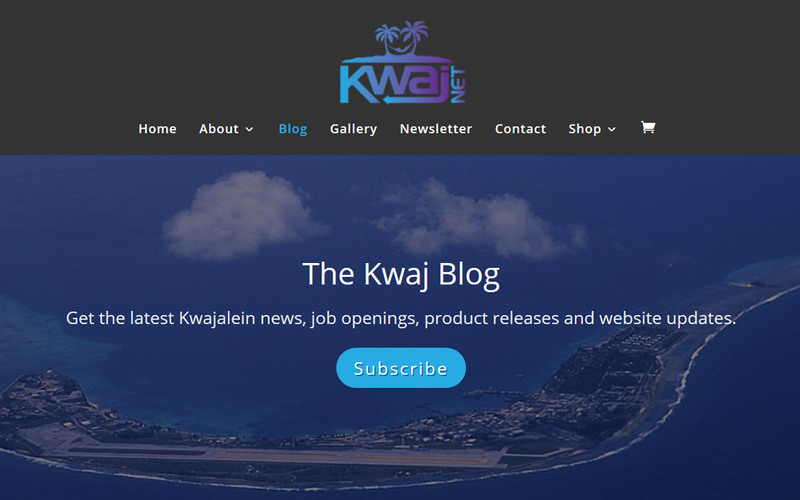 The Kwaj Blog isn’t just about Kwajalein job announcements. I also share website updates, summaries of The Kwaj Current video series (oops, I need to catch up on those), new product announcements and soon I’ll be posting Kwajalein Hourglass summaries with a links to the downloadable PDFs. Well, I would love for you to sign up for that as well. Incentive? Starting 1 November 2018, all new subscribers will be sent a one-time 15% discount to use at The Kwaj Shop! The newsletter, which I’m hoping to make a monthly thing, will be a compilation of the blog and Facebook activity, special store offers that only share with newsletter recipients, etc. Mainly, I just wanted to give people the convenience of keeping up with Kwaj Net in their own preferred way. Surprisingly, not everybody is on Facebook, so the newsletter and the blog are great alternatives. You can subscribe to the blog by going to The Kwaj Blog main page and clicking the blue Subscribe button at the top of the page. You’ll be taken to the registration page where you will choose a username and provide your email address. A confirmation email will be sent to you with a link to set your password. The link will take you back to the website, where you will choose your password. Please make it a strong one! Then you’re all set. You’ll get an email notification every time I make a blog post. You will also be automatically registered as a customer at The Kwaj Shop. If you ever have any questions about the blog or Kwaj Net in general, please send them via the Contact page and I’ll get back to you as soon as possible. Last, but very not least, THANK YOU! Your support means the world to me, especially when you buy gifts at The Kwaj Shop. Every sale helps me pay for web hosting and all of the related software/services that I use maintain the site and run the business, all so I can keep serving you!